Ali writes clearly and concisely, without letting too much prose get in the way of her plot. There isn’t a slow spot in Lycoplis: it starts with action and ends with action. She gets into her characters’ heads and brings out their individual personalities so that we learn to love every single one of them. My goal with writing is always to avoid letting words get in the way of the story, so I’m really glad that worked! And it’s great to know that the fast pace of the story worked too (huge thanks to Lorna Fergusson from fictionfire for her insightful editorial help on that). The ending of Lycopolis did not disappoint. It was a fast read and made the perfect weekend escape. The plot was original and refreshing, and although some of the sub-plots were left on a loose end, I finished the book with satisfaction. 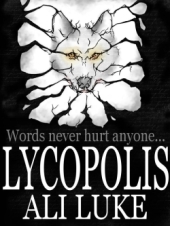 Lycopolis is the first book of a planned trilogy, and I look forward to reading the sequel. You can read the whole review here on Underground Book Reviews. AB: Your characters make up an eclectic cast. Did you base them off of people you know, or did you summon them up from your imagination? Ali: None of them are based on anyone real. I’d say that all of them carry some aspects of me (even the less-than-nice characters…) and I’m sure that’s the case for every author. After all, writing fiction is about getting inside people’s heads, and the only head we have access to is our own. You can read the whole interview here on Underground Book Reviews.